Jack & Coach Raveling talk about players and their expectations of themselves. 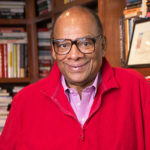 Coach Raveling believes that players need to see themselves in a broader perspective, beyond the individual, beyond the team, and beyond basketball. Jack & Coach also discuss what it takes to be a great teammate, how important the willingness to sacrifice is for success, and the vital importance of respect for each other both as individuals and a collective team.